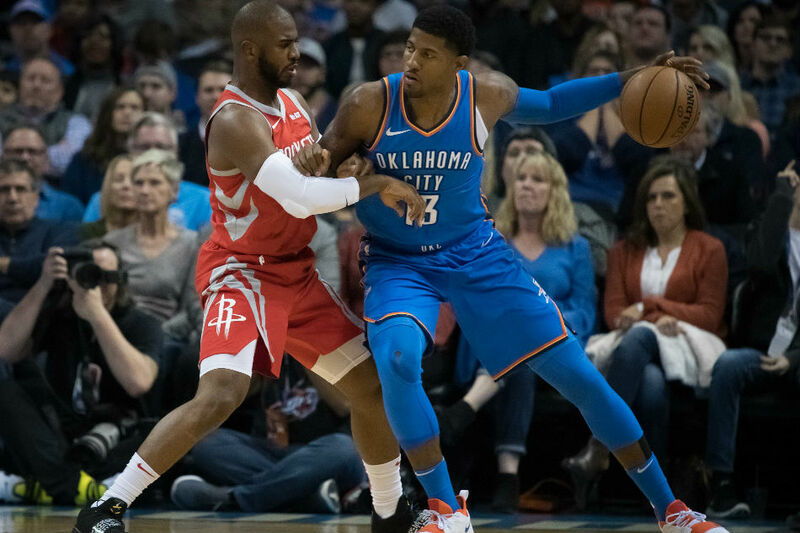 Paul George had 20 points and 11 rebounds as the Oklahoma City Thunder won their seventh consecutive game, beating the visiting Houston Rockets 98-80 on Thursday night. The loss snapped a three-game winning streak by the Rockets, who were led by James Harden's 19 points. But Harden was just 7 of 19 from the floor and 4 of 12 from behind the 3-point line. Houston's 80-point scoring effort was the lowest for an NBA team this season. Both teams struggled from behind the 3-point line, though. Oklahoma City was 9 of 37 (24.3 percent) from beyond the arc while Houston was 11 of 42 (26.2 percent). The Thunder were without Russell Westbrook for the second consecutive game after Westbrook suffered a sprained ankle in Monday's win over New Orleans. But while the Thunder looked lost at times without Westbrook during the season's first two games as the star point guard returned from offseason knee surgery, Oklahoma City used defensive intensity to find a way to win without him this time around, holding the Rockets to just 37.8 percent from the field. The Thunder scored the final 10 points of the first quarter to take a 29-19 lead early, then finished the second with a 21-6 run to lead by 14 at the break. The third was low scoring overall but Oklahoma City still outscored the Rockets 14-5 over the final seven minutes to take a 20-point lead going into the fourth. He scored just two points, going 1 of 11 from the field in 20 minutes.